VITEEE Cut Off: The Vellore Institute of Technology, more popularly known as VIT, is one of the best private engineering institutes in the country. It is a deemed university. Every year, it conducts VIT Engineering Entrance Test (VITEEE) to select candidates for admission to engineering courses in the four campuses of the institute – Vellore, Chennai, Bhopal, and Amaravati. It is a highly competitive exam and hence, having knowledge of VITEEE Cut Off will help you. It will give you an idea about the marks that you must score to qualify the exam. But VIT usually doesn’t announce the VITEEE Cut Off in a formal manner. Even if it is announced, it will be in the form of closing ranks for the respective branches. 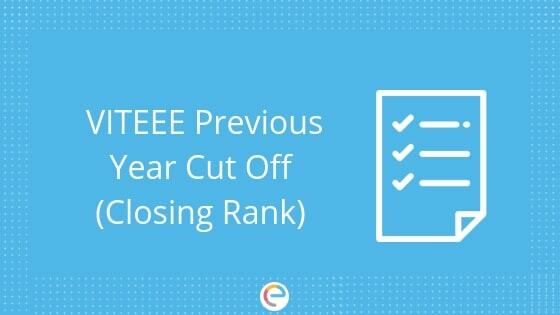 In this article, we will provide you with detailed information about VITEEE Cut Off of previous years in the form of Closing Rank for all branches. Candidates must prepare in a way that they get a better rank than the Closing Rank of the branch they want to join. Read on to find out the VITEEE Cut Off for previous years. Before getting into the details of VITEEE Cut Off of previous years, let’s look at the factors determining the VITEEE Cutoff. As you can see, the VITEEE Cut Off depends upon a lot of factors and hence, changes every year. So, the VITEEE Cut Off 2019 will also depend upon the factors mentioned above. The cutoff given in this article is just to give you an idea about what rank you must secure to get a seat in your desired branch. VITEEE is conducted in the online mode. It conducted on multiple days, with three sessions per day. In order to tackle the problem of varying difficulty level of the paper across slots, the percentile method is used to determine the rank of the candidates. Candidates appearing in different slots securing equivalent percentile score get the same rank. VITEEE counselling process will be conducted after the VITEEE results are declared and the VITEEE merit list is issued. The VITEEE counselling process is conducted in the offline mode. The counselling is conducted in two phases – Phase 1 and Phase 2. VITEEE counselling Phase 1 is for candidates securing rank from 1 to 20000. Candidates securing rank from 20001 to 150000 are eligible to appear for VITEEE counselling Phase 2 and take up the seat left after Phase 1 VITEEE counselling. The VITEEE Cut Off Closing Rank is the last rank who got admission to the respective course. Let us now look into the different courses offered by the Vellore Institute of Technology. Now that you have a clear idea about the various engineering branches offered in the four campuses of VIT and the VIT Cut Off of previous years (Closing Rank for different branches), you know what minimum rank you must secure in order to get into your dream branch. However, it is recommended you finish the entire VITEEE syllabus and prepare in a way that you score as high as possible and get a good rank. That way your admission to your desired branch will be guaranteed. Preparing for JEE Main will help you in VIT as well. Because the syllabus is more or less same and VITEEE is easier than JEE Main. So, take VITEEE previous year test and VITEEE mock tests for free on Embibe. You can also get personalized guidance with Embibe’s premium product, RANKUP, which uses Artificial Intelligence to help you in your preparation and guarantee score improvement. We hope this detailed article on VITEEE Cut Off helps you. If you have any query, drop a comment below. We will get back to you.